Intense pulsed light (IPL) is similar to a laser, differing only in the physics of the light device. IPL is an excellent treatment for brown and red spots (freckles, sun damage, blood vessels, rosacea). It is given as a series of treatments, usually every 3-8 weeks. Some conditions may resolve after 1-2 treatments. Others may require more treatment sessions. The acne handpiece with IPL is used to treat acne. IPL kills the bacteria that are involved in causing acne. It also may have a beneficial effect on the sebaceous (oil) glands of the skin. It is given as a series of treatments, typically every 2-4 weeks. 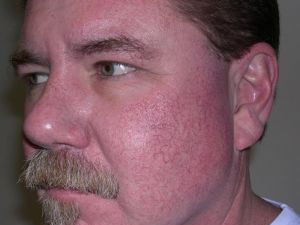 Pictured below is a patient treated by Aesthetic Dermatology Associates for rosacea.